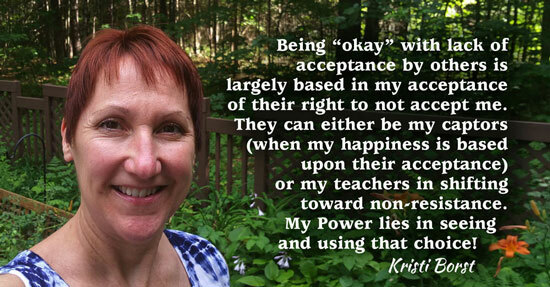 Healing Resonance Articles by Kristi Borst: What Are You Resisting? Many times it's the actions of others that sends us off our center of peace. But when we realize that on many levels this lack of peace is our choice and not theirs, we can move to a space of empowered living ... I call it "Self Mastery". Will others be your Captors? Or will they be your Teachers? It is only when we are in observation of our own state of peace, that we can see our choices more clearly! Only we can see if we're being dragged, tooth and nail, or blown over like a feather ..
To illustrate, I have a friend whom I'll call Sally. Sally feels very off-balance when she's around her sister-in-law Amanda. Sally feels that Amanda is in such a victim mode and always sees the dark side of every situation. When Sally is around Amanda, she feels unsure of herself because Amanda is "just waiting for her to mess up". Sally has been totally stressing out all week in anticipation of being with Amanda in the coming days for Father's Day. Sally went on to say, "Amanda's the only person that I've been forced to have in my life that thinks the worst of me and is waiting for any dirt she can dig up on me. It's sad, and hard for me to deal with. Typically I just say 'see ya later' to people like her but I can't because of the family situation." Does that resonate? Sally said "sadly", but I say "perhaps by design for our Self Mastery" it's those within our closest circles that may not actually SEE us. So be it. Maybe we're not totally seeing them either! What if this lesson of knowing who we are, OWNing who we are, is part of your life path? Throughout her life, the Universe has served her up teachers (some may call them "button pushers") who have "made her" feel less than. Rather than seeing her own power to know who she is, she's dropped them and moved on to people who "make her feel good about herself". But, my friend, that is an inside job.